Grouse are an ecologically important group of birds with a holarctic distribution in the tundra, forest and grassland ecosystems of Europe, Asia, and North America. Field studies of grouse have played a long and important role in the ecological sciences, including population biology, behavioral ecology, evolutionary ecology, conservation biology, and wildlife management. In population biology, long-term studies of grouse have provided important insights into the ecological factors regulating and limiting the dynamics of cyclic populations under natural conditions. Grouse are key prey items for specialist predators such as gyrfalcons, but also generalist predators such as coyotes, red fox and other species. Population studies of grouse and their predators have provided insights into the trophic dynamics that structure populations of northern vertebrates. Grouse are also noteworthy because they display a remarkable diversity of mating systems, which range from social monogamy to classic lek-mating systems. Studies of grouse mating systems, parental care and their ecological correlates now provide illustrative examples in major textbooks in behavioral ecology. In recent years, development of molecular methods has provided new tools for exploring the evolutionary ecology of grouse, and there is growing recognition that life-history traits of grouse may covary with ecological gradients such as altitude, latitude and levels of anthropogenic disturbance. Unfortunately, grouse populations in many areas have been negatively impacted by human activities, and understanding the effects of ongoing changes in land use and land cover change remain key issues. However, success of translocation efforts and other conservation actions provides encouragement for development of mitigation and recovery efforts. In fact, several species of grouse have been proposed to be umbrella species for sensitive ecosystems, including capercaillie in forests and prairie chickens in native grasslands, and conservation efforts for grouse could benefit entire communities. Finally, grouse have had long-standing importance for recreational and subsistence harvest in northern regions, and extensive time series of bag data are available from many areas. Studies of hunted grouse made important early contributions to theoretical developments in sustainable harvest strategies for wildlife populations, which continue to be developed and refined with new experimental work. Current issues in grouse biology are discussed every three years at regular meetings of the International Grouse Symposium. The symposium is international in scope and with previous meetings in Scotland (1978, 1981), England (1984), Germany (1987), Norway (1990), Italy (1993), United States (1996), Finland (1999), China (2002), and France (2005). This book was launched as project following the 11th International Grouse Symposium which was held September 11-15, 2008 in Whitehorse, Yukon, and the first grouse symposium to be held in Canada. The 11th symposium was organized with generous support from the Centre for Applied Conservation Research at the University of British Columbia, the Pacific and Yukon Region of Environment Canada, and Yukon College. Following a successful meeting, participants and other wildlife biologists were invited to submit manuscripts for an edited volume on grouse biology. Authors submitted a total of 43 manuscripts which were evaluated by two rounds of peer review. We extend our deep thanks to the reviewers who assisted this volume with careful and constructive evaluations of the manuscripts: Cameron Aldridge, Tony Apa, Todd Arnold, Erin Bayne, Jeff Beck, Hans-Heiner Bergman, Juan Bouzat, Clait Braun, Miran Cas, Isabella Cattadori, Jack Connelly, Kevin Doherty, Peter Dunn, Renata Duraes, Bradley Fedy, Sam Fuhlendorf, River Gates, Alicia Goddard, Michael Gregg, Christian Hagen, Susan Hannon, Rick Hoffman, Matt Holloran, Jodie Jawor, Kent Jensen, Robb Kaler, Siegfried Klaus, Michael Larson, Gilbert Ludwig, Tobias Ludwig, Jesus Martinez-Padilla, Conor McGowan, Lance McNew, Terry Messmer, Michael Morrow, Olafur Nielsen, Neal Niemuth, Claude Novoa, Michael Patten, Noah Perlut, Jim Pitman, Shin-Jae Rhim, Beth Ross, Michael Runge, Jonas Sahlsten, Stefan Schindler, Michael Schroeder, Jim Sedinger, Nova Silvy, Kjell Sjöberg, Mark Statham, Ilse Storch, Egbert Strauss, Dominik Thiel, Brett Walker, Chris Williams, Scott Wilson, Kimberly With, Don Wolfe, Andrew Yost, and Guthrie Zimmerman. The final volume was jointly edited by a team of three Associate Editors including Brett K. Sandercock, Kathy Martin and Gernot Segelbacher. The editors thank the Norwegian Institute for Nature Research in Trondheim, Norway and Kansas State University (BKS), Environment Canada and the University of British Columbia (KM), and the University of Freiburg (GS) for institutional support during preparation of this volume. The Studies in Avian Biology series has been published by the Cooper Ornithological Society since 1978 and we are proud to be part of this long-standing series. The former Series Editor, Carl Marti, provided great encouragement during initial development of the project, and we deeply regret that he was unable to see this work completed before his death. We thank Chuck Crumly for his efforts as Science Publisher for helping us to manage a successful transition to University of California Press as the new publisher for the series. Ecology, Conservation, and Management of Grouse contains 25 chapters authored by a total of 80 contributors. The global distribution of grouse spans a large number of ecological and political units, and the diversity of topics in the contributed chapters reflects the broad range of questions that can be investigated with this important group of birds. Our volume has been organized into four main sections. In Spatial Ecology, seven chapters include investigations of valuable landscape tools for modeling grouse occurrence, and intensive studies of radio-marked birds to understand movements in response to seasonal changes, disturbance from anthropogenic structures, and landscape fragmentation. In Habitat Relationships, six chapters examine the links between habitat use and reproductive performance in two sensitive species of grouse, Greater Sage-grouse and Greater Prairie-chickens. In Population Biology, the seven contributed chapters include an experimental manipulation of testosterone under field conditions, population studies of grouse demography under different ecological conditions, and intriguing evidence of life-history changes in response to human activities and breeding in alpine habitats. The final section in Conservation and Management includes five contributed chapters investigating the troubling impacts of global change on alpine populations, successful use of translocations to reestablish an island population, and the impacts of harvest on the mortality rates of birds in hunted populations. Much of the new data on the biology of grouse has been collected with an impressive set of tools that characterize modern ecology: biogeochemistry, molecular genetics, endocrinology, radio-telemetry, and remote sensing. 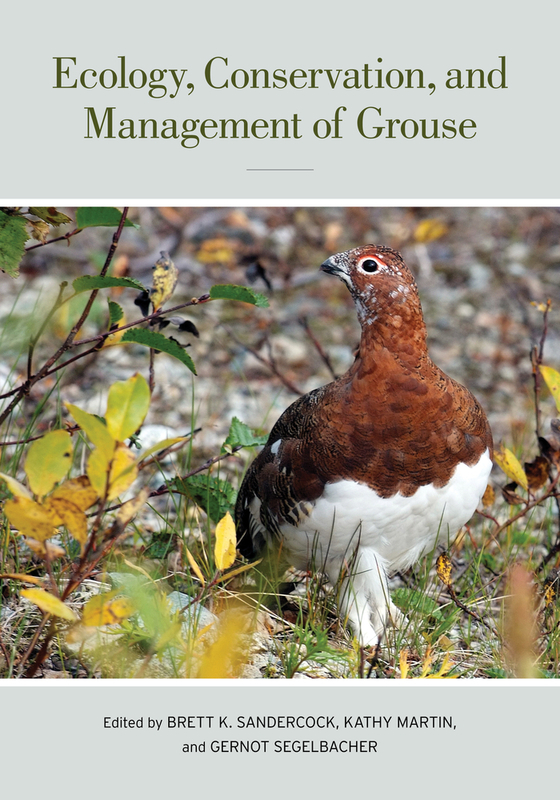 Conservation and management of grouse is increasingly a global concern, but the exciting new data in this volume should be useful in identifying conservation priorities and enabling action documents for conservation agencies, wildlife biologists, and managers. Please enjoy learning about current themes in grouse research, and we hope that the new information in this volume will aid conservation efforts for sensitive populations of grouse, their critical habitats, and associated species of wildlife. Grouse—an ecologically important group of birds that include capercaillie, prairie chickens, and ptarmigan—are distributed throughout the forests, grasslands, and tundra of Europe, Asia, and North America. Today, many grouse populations are in decline, and the conservation and management of these charismatic birds is becoming a global concern. This volume summarizes current knowledge of grouse biology in 25 chapters contributed by 80 researchers from field studies around the world. Organized in four sections—Spatial Ecology, Habitat Relationships, Population Biology, and Conservation and Management—the chapters offer important insights into spatial requirements, movements, and demography of grouse. Much of the research employs emerging tools in ecology that span biogeochemistry, molecular genetics, endocrinology, radio-telemetry, and remote sensing. The chapters explore topics including the impacts of climate change, energy development, and harvest, and give new evidence for life-history changes in response to human activities. Brett K. Sandercock is Associate Professor in the Division of Biology at Kansas State University. Kathy Martin is Professor in the Department of Forest Sciences and Director of the Centre for Alpine Studies at the University of British Columbia. Gernot Segelbacher is Lecturer at the University of Freiburg in Germany. "This volume is exciting from the perspective of a grouse biologist but also from a more general ecological perspective. It provides an excellent synthesis of the ecology and conservation of these fascinating and beautiful inhabitants and their ecosystems, which are as diverse as tundra, forest, and grassland." --Hans Christian Pedersen, Professor and Senior Scientist, Norwegian Institute for Nature Research. Nicholas W. Kaczor, Kent C. Jensen, Robert W. Klaver, Mark A. Rumble, Katie M.
Ty W. Matthews, Andrew J. Tyre, J. Scott Taylor, Jeffrey J. Lusk, and Larkin A.
Eddie K. Lyons, Ryan S. Jones, John P. Leonard, Benjamin E. Toole, Robert A.
Sara J. Oyler-Mccance, Craig A. Stricker, Judy St. John, Clait E. Braun, Gregory T.